State of the City Address is a great opportunity to hear from our community leaders under one roof. 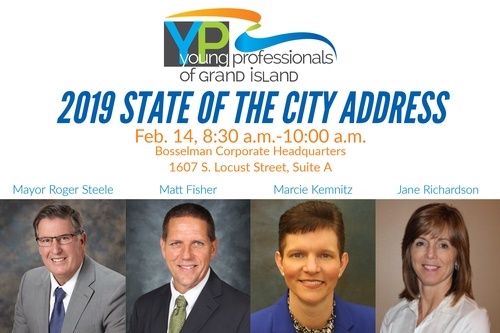 This year's address will feature Grand Island's newly elected, Mayor Roger Steele, Hall County Board Supervisor, Jane Richardson, Central Community College, Campus President, Dr. Marcie Kemnitz and Northwest Public Schools, Superintendent, Matt Fisher. These leaders will be presenting on their current goals along with any challlenges they may face in the near future. We hope you will join us for this informative event. Time: 8:30 a.m. - 10:00 a.m.